Create beautiful videowalls in an affordable fashion. The Samsung 55" UD55E-B Digital Signage Display features an ultra-thin bezel for virtually seamless matrices. Factory calibration provides brightness and color uniformity across multiple displays. And you can achieve 4K UHD resolution when you daisy chain multiple displays with the Display Port 1.2 digital loop-out feature, without the cost of external processing scalers and distribution boxes. The ACM solution provides a user-friendly interface to implement customized and detailed color adjustments. Fine-tune luminance, temperature, and gamma through auto calibration, manual calibration and duplication to achieve the perfect display for your business. Save installation time for multiple displays with Magic Clone. Simply enter your display settings the first time, save the setting information to a USB or external HDD and plug in the external device to the other sets to install them equally. 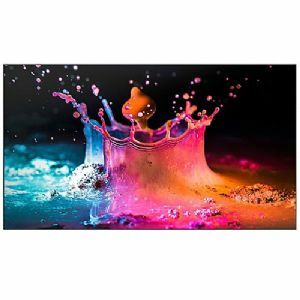 This Direct-Lit LED display delivers crystal clear visuals in Full HD (1920 x 1080) with 500 nit brightness. Enjoy convenient content creation and management. Create your desired content on a single display and turn on Image Rotation to transform portrait orientation into horizontal, and vice versa, when you connect and split-screen multiple displays in a videowall matrix. Purchase the Samsung 55" UD55E-B Digital Signage Display today!